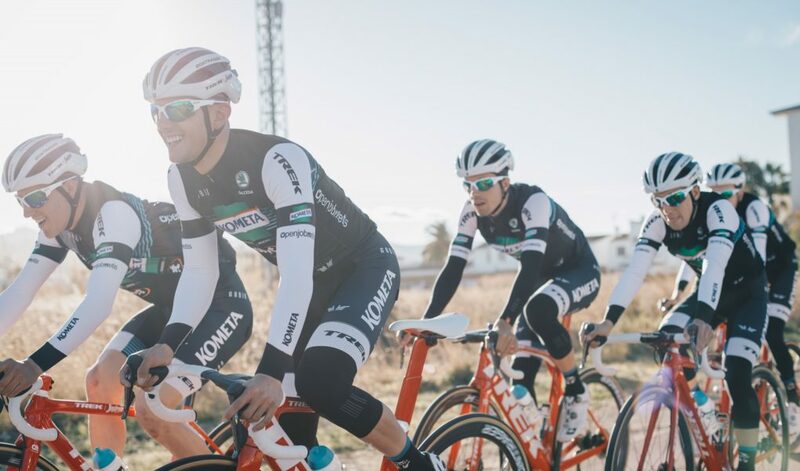 We are glad to support Kometa Cycling Team young talents as Official Supplier for the 2019 racing season. The Spanish-registered squad created by the great champion Alberto Contador uses our complete range of products. “In a professional cyclist team there are always sponsors that have greater visibility than others, but that does not imply that their importance is less. ” said the Team Kometa General Manager Fran Contador. “All the support of a team is fundamental to its functioning and its existence. And with Bend36 we found a great example: Alessandro Rombelli is a great lover of this sport and that enormous love is not only born his confidence in this project, but a tangible contribution to the cycling universe that seeks to improve its practice and its enjoyment. In Kometa Cycling Team we felt it with its own brand because in fact both Ivan Basso and Alberto Contador, and of course our continental squad, have collaborated in his birth and now we can enjoy its benefits”. “I’m feeling very well with the Bend36 products,” said Michele. “It is a complete range that for us is really essential for both recovery and pre-race. I use in particular the Chamois Cream and the Relief Gel, cause I had in the past several problems brought by the saddle support. Since I use these products I have practically eliminated this pain. This is very important for a cyclist, especially in the context of a stage race when the next day you have to start despite pain! I’m really satisfied and I hope this collaboration will last for a long time, because at least the races are won even looking at the detail!